This entry was posted in Which Open Source Blog on March 25, 2012 by Administrator. Your site has never looked better on a Mobile Device! Contrast is a beautifully minimal, and awesomely responsive WordPress Theme that is perfectly suited for Creatives (Designers, Photographers, Motion Artists). The theme is fully responsive, and looks spectacular on your Desktop, Tablet device, and all the way down to the latest Smartphones. Customize with the minimal of fuss! Add Custom Page layouts with ease! Page with the usual Sidebar, Full-Width page, One with a Custom Contact Form built-in. Create a page, choose a custom page style. Simple as that! Localization support is provided out-of-the-box, ready to translate your theme into your chosen language. Visit the responsive preview site and resize your browser to see Contrast in action, or visit the site here directly on your mobile device. I am so loving this theme, it has to be one of the very best I have had. I also rated you 5 stars, I would like to give it more but it only goes up to 5. Love the theme and Marc, you have been a big help! Let me first thank you for the great theme, I purchased it few days ago and it’s exactly what I was looking for : simple, responsive and easily customizable. Beautiful preset color schemes, with color-coded Social Media icons! Looks awesome on your Desktop, Tablet, and Smartphone! This entry was posted in Which Open Source Blog on March 23, 2012 by Administrator. 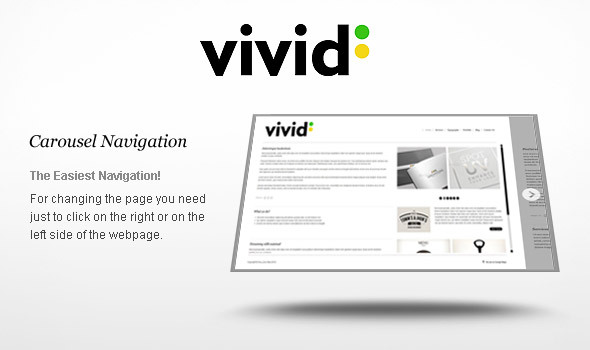 Vivid – jQuery/HTML Template is a Clean and Minimal with Carousel Navigation, can be easily used as a personal portfolio or a business website. This entry was posted in Which Open Source Blog on March 17, 2012 by Administrator.